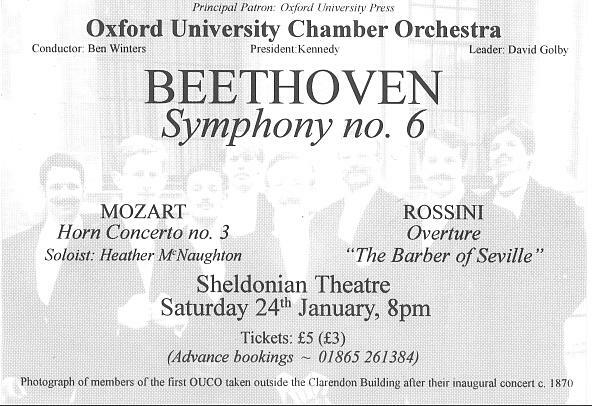 Friday 20 November 1998 Sheldonian Theatre, Oxford Beethoven Egmont overture, Schubert symphony No. 4 "Tragic", Brahms violin concerto. Soloist: Simon Fischer. Tickets £6 (£3), telephone 01865 798600. 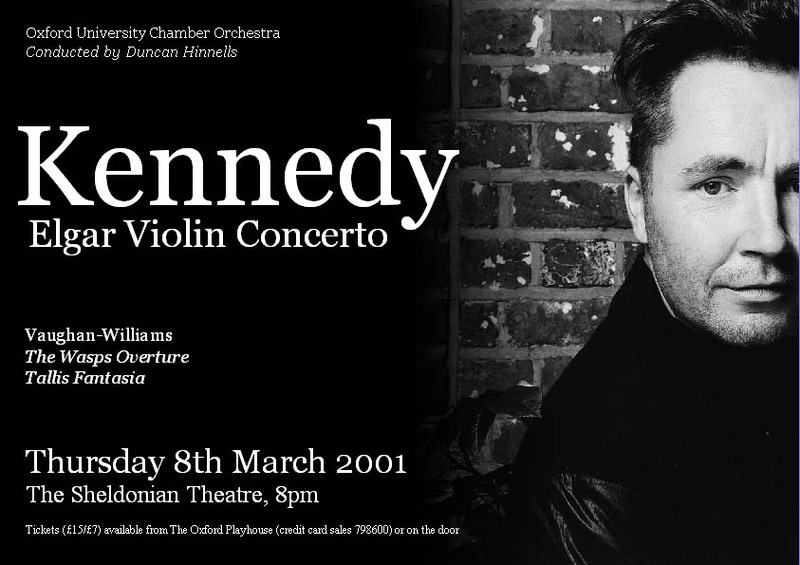 Sat 18th Nov 2000 Sheldonian Theatre, Oxford. Shostakovich Symphoney No. 1, Prokoviev Violin Converto No. 2. 8pm, Friday 25 Jan 2002. Sheldonian Theatre, Oxford. Beethoven: Egmont overture. Mozart: Recitative and Aria,"Don Ottavio, son morta.Or sai chi l'onore"from Don Giovanni. Ravel: Tzigane for Violin and Orchestra. Stravinsky: Symphony in Three Movements. Solo violin: Elizabeth Hodson. 8pm, Saturday 22 Feb 2003. Sheldonian Theatre, Oxford. Mozart: Overture Don Giovanni, Mozart: Sinfonia Concertante (Violin & Viola), Mozart: Symphony No. 40. 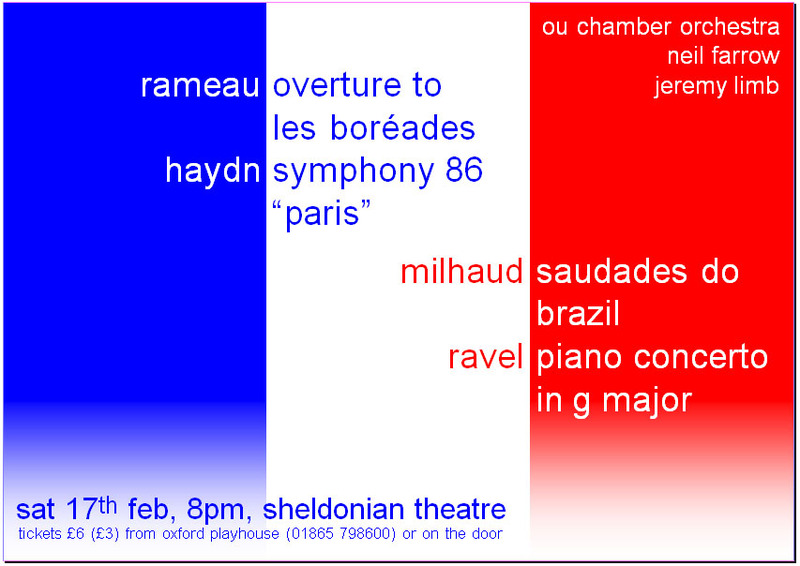 Tickets Oxford Booking page Conductor: Tagbo Ilozue, Soloists: David Golby & Heather Birt. 7:30pm, Saturday 22nd November 2003. Sheldonian Theatre, Oxford. Bruch violin concerto. Beethoven symphony no. 9. Conductor: Jacques Cohen. 8pm, Friday 28th May 2004. Sheldonian Theatre, Oxford. Schubert: Symphony No. 8 (Unfinished). Stravinsky: Firebird Suite. Tickets Oxford Booking page Conductor: Jonny Williams. 8pm, Friday 25th February 2005. Sheldonian Theatre, Oxford. Britten: King Arthur (extracts). Saturday 25th February 2006. Sheldonian Theatre, Oxford. Mozart: symphony No. 31 "Paris". Poulenc: Concerto for organ, strings and timpani. Saturday 27th May 2006. Sheldonian Theatre, Oxford. Beethoven: Egmont Overture. 2006 November 25 (Saturday) 7:30pm University Church, Oxford. Korngold: Suite, Much Ado About Nothing. Haydn: Symphony No. 101 in D "The Clock". Sibelius: En Saga, op 9. Tchaikovsky: Symphony No. 6 in B minor, 'Pathétique', op 74 £10 (£5). 2007 October 26 (Friday) Sheldonian Theatre, Oxford. Beethoven: Coriolan Overture, Op 62. Shostakovich: Chamber Symphony (arr Rudolf Barshai), Op 83a. When: 2008 February 29 (Friday), 8pm. Available on the door, Tickets Oxford's website, or from Tickets Oxford at the Oxford Playhouse, 11-12 Beaumont Street, Oxford, Tel. 01865 305305, ticketsoxford@oxfordplayhouse.com. When: 2008 May 24, 8pm. When: 2008 November 1st, 8pm. Rossini: Overture to 'William Tell'. Richard Strauss: 4 Letzte Lieder, '4 Last Songs'. Saint-Saëns: Symphony No 3 in C minor, 'Organ', Op 78. When: 2009 February 27th (Friday). Schumann: Symphony No 3 "Rhenish"
When: 2009 May 16 (Saturday). Where: Town Hall, St Aldates, Oxford. The Oxford Playhouse, 11-12 Beaumont Street, Oxford, Tel. 01865 305305. When: 2009 November 15 (Sunday). Where: The Oratory School, Woodcote, Reading. Programme: Elgar: Dream of Gerontius. When: 2010 May 22 (Saturday) 8pm. Where: The University Church of St Mary the Virgin, Oxford. Mozart: Divertimento No 3 in F, K138. Mozart - Concerto for Piano and Orchestra No 20 in D minor, K466. Schubert - Symphony No 5 in B flat, D485. Tickets: Please see our Oxford Playhouse Tickets Oxford page. When: 2010 November 19 (Friday). Also see the Concert Diary page for this concert. When: 2011 Febrary 26 (Saturday). Where: University Church, High Street, Oxford. When: 2011 May 21 (Sat) 8pm. When: 2011 November 26 (Sat) 8pm. Votre Toast from Bizet's Carmen. Habanera or Chanson Boheme from Bizet's Carmen. Flower duet from Lakme - Delibes. Au fond du Temple saint - Pearl Fishers Duet - Bizet. Libiamo - La Traviata - Verdi. Nessun Dorma - Puccini's Turandot. Tickets: Please se the Dorchester Abbey website. When: 2013 March 9, 8pm. When: 2013 July 6, 8pm. When: 2013 November 30 (Sat) 8pm. When: 2014 March 1 (Sat) 8pm. Tickets: £15/£10 concessions from Oxford Playhouse 01865 305305 or Oxford Playhouse Tickets Oxford. When: 2014 June 28 (Sat) 8pm. When: 2014 Nov 22 (Sat) 8pm. When: 2015 Mar 14 7:30pm. When: 2015 June 13, 8pm. Where: Wesley Memorial Church, New Inn Hall St, Oxford, OX1 2DH. Tickets: Oxford Playhouse 01865 305305 or Oxford Playhouse Tickets Oxford. When: 2015 November 7, 8pm. Where: University Church, Oxford, OX1 2DH. When: 2016 July 2, 8pm. Tickets: Oxford Playhouse 01865 305305 or Oxford Playhouse Tickets Oxford. Tickets also available on the door. When: 2016 November 5, 8pm. Where: Wesley Memorial Church, New Inn Hall Street, Oxford, OX1 2DH. When: 2017 February 4, 8pm. When: 2017 June 17, 8pm. When: 2017 November 11, 8pm. Tickets: Oxford Playhouse 01865 305305 or Tickets Oxford. Tickets also available on the door. When: 2018 March 3, 7:30pm. Where: Wesley Memorial Church (New Inn Hall Street, Oxford). When: 2018 June 16 (Sat) 8pm.